Properties in Andalusia average 4.6 out of 5 stars. Peace and views in this off the beaten track chalet, set in the tabernas desert. Property 1: Peace and views in this off the beaten track chalet, set in the tabernas desert. Property 5: Villa in Los Caños de Meca of 1000m2 plot next to the countryside and the beach. 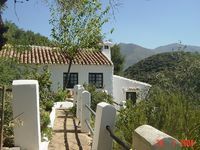 Chalet in Los Caños de Meca of 600m2 plot next to the countryside and the beach. Property 6: Chalet in Los Caños de Meca of 600m2 plot next to the countryside and the beach. Casita in the peace and quiet in the Tabernas Desert. Enjoy the views. Property 15: Casita in the peace and quiet in the Tabernas Desert. Enjoy the views. Luxury Villa: Vista Sevilla. Pool, gardens & terraces close to Seville! Property 35: Luxury Villa: Vista Sevilla. Pool, gardens & terraces close to Seville! INDEPENDENT VILLA WITH POOL NEAR THE BARROSA BEACH AND NATURAL PARK. Property 49: INDEPENDENT VILLA WITH POOL NEAR THE BARROSA BEACH AND NATURAL PARK. Perfect place to stay while visiting southern Spain. We made this our home base and took day trips from there. Love the town of Casares lots of good restaurants and walking trails. Shirley was a wonderful host helping us when ever we had a questions, her terrace garden we stunning .